Canada – The term “multi-functional” doesn’t normally conjure up images of stateliness and elegance, but the two concepts reside together in perfect harmony within the walls of the Theatre St-James. 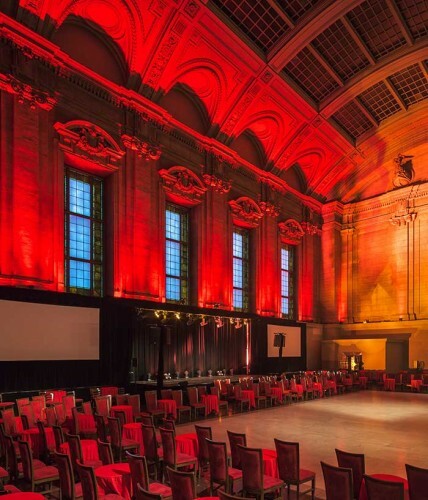 Located on Montreal’s Rue Saint-Jacques, the majestic four-storey building transfixes visitors with its towering fluted columns, elaborate masonry work and a spectacular stained-glass ceiling suspended 22 metres above the floor of its main hall. Once the home of the Canadian Imperial Bank of Commerce, the building has been converted into a multi-purpose venue that hosts an impressive array of events, ranging from boxing weigh-ins to fashion shows – not to mention wedding receptions, charity events, concerts and theatrical productions. 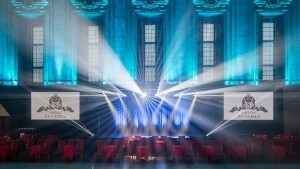 Accenting this unique venue’s beautiful architectural features and contributing to its versatility is a powerful lighting design by Garou Blancan of Montreal’s XYZ Technologie Culturelle that draws on a collection of flexible, high output Chauvet Professional LED fixtures supplied by JAM Industries. 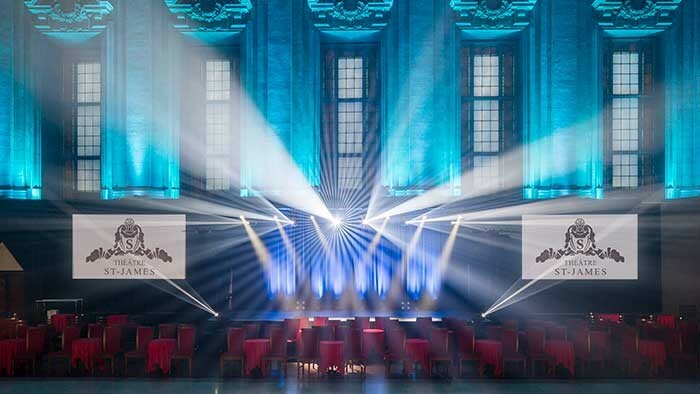 Positioned throughout the building’s 930-square-meter main hall, the fixtures in Blancan’s design include: eight Ovation E-190WW ellipsoidals, four Strike 4 multi-formatted fixtures, four Ovation F-165WW Fresnels, eight Rogue RH1 Hybrids, eight Rogue R2 Washes, and ten COLORado 1 Solo par-style RGBW washes from Chauvet Professional, as well as 12 Chauvet DJ COREpar 80 USB washes. 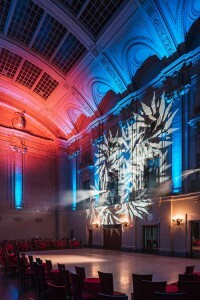 Blancan became involved in lighting the Theatre St-James after the owner of Montreal’s Rialto Theatre (which the designer had illuminated earlier) purchased the historic structure. 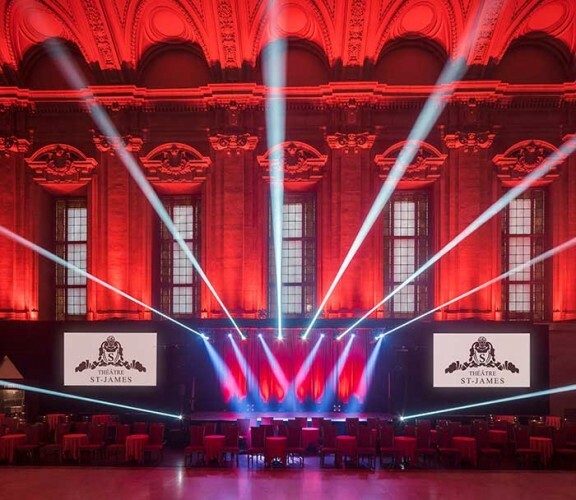 Given the creative freedom to work with a mixture of architectural and entertainment lighting, he had one objective: to create a design that was flexible enough to handle the myriad of events hosted at venue, but at the same time would preserve and enhance the building’s beauty. Contributing to the versatility of the rig, says Blancan, is the wide zoom range of the Ovation E-190WW and COLORado 1 Solo fixtures. Also adding to the flexibility are the multi-functional features of the Rogue RH1 Hybrid and Strike 4 fixtures. 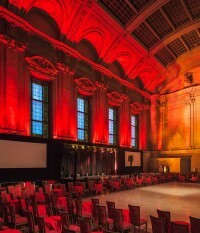 Like the Theatre St-James, these fixtures, when used by a talented designer, are capable of meeting a wide range of needs, all while looking very, very good.